Carnelian, a sunshine stone of positivity and vitality, is a common stone that you can buy with change you find at the bottom of your purse; but its regenerative power is not to be underestimated! I gained a great respect for the humble Carnelian when I was attending a Gemisphere crystal healing workshop, and I came down with a serious case of strep throat. My tonsils were coated in white spots, and it felt like I was swallowing razor blades. I had traveled all the way to Oregon, and I was determined to participate. So I made a pallet on the floor and buried myself underneath blankets, hoping I would absorb some of the information. In this workshop, we covered many different crystals and stones in a precise way. Each time we talked about a new one, we would put on a high-grade, therapeutic Gemisphere necklace made of that stone; and we would remove all other stones from the room so that we could immerse ourselves solely in the energy of that stone. When we got to Carnelian, I miraculously came back from the dead in about fifteen minutes! Within a few minutes of wearing Carnelian, I felt clearer, more awake, and was able to sit up. Then a few minutes later, I noticed less pain when I swallowed. Then next thing I knew, I actually felt compelled to stand up and jump around. I felt cured! On the break, I ran to the bathroom and looked at my throat in the mirror. My tonsils were considerably less swollen and actually looked normal. I couldn’t believe it, and neither could my classmates, who witnessed the practically instantaneous healing. I was able to complete the rest of the workshop with no physical symptoms and a boundless amount of energy. Since then, Carnelian has been a stone that I turn to for quick healing, energizing, and breakthroughs. Carnelian is a form of Chalcedony, belonging to the Quartz family. It occurs in varying shades of orange, due to its iron content. You’ll find Carnelians that are brownish orange, pale orange, or deep red-orange. Some specimens display beautiful, banded patterns, such as the captivating Carnelians in my personal collection, pictured here. 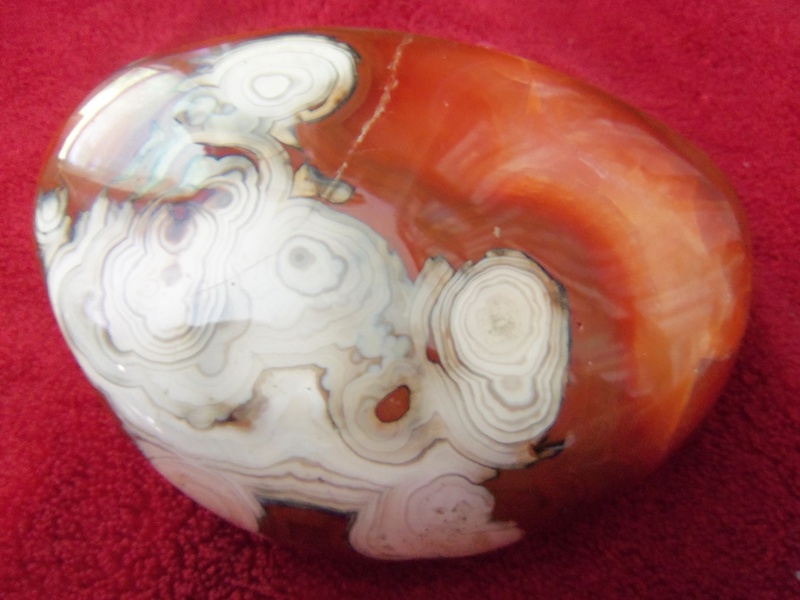 Many ancient cultures recognized Carnelian as a stone of power. For example, the Egyptians believed that Carnelian had healing and protective powers, and they also believed that it neutralized negative emotions, such as jealousy and anger. In Tibet and India, Carnelian was seen as a lucky charm, bringing fortune, fame, and blessings. And Native Americans believed that Carnelian enhanced sexuality. My experiences with Carnelian are in alignment with these ancient beliefs and uses. Carnelian has an activating quality that does so much to boost the functioning of the physical body. 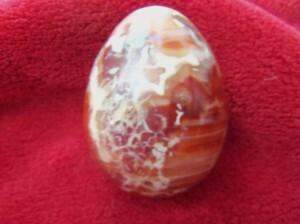 Many stones with an orange color ray have an energizing effect. According to Michael Katz, founder of Gemisphere, Carnelian is specifically suited to strengthen the immune, endocrine, and lymphatic systems. My introductory story clearly demonstrates how effective Carnelian can be in fighting off infections. If you feel like you are coming down with something, consider Carnelian to be a crystalline form of Echinacea. (Of course, if you are facing a medical issue, always go to your doctor and follow any medical advice given. Crystal healing is not intended to take the place of conventional medicine, but can safely be used to speed up the healing process.) Carnelian is also the perfect stone to turn to if you are experiencing hormonal imbalances, a sluggish metabolism, or a general lack of life force. It fortifies the glands, gets things flowing again in the reproductive system, and makes you feel more energetic in your body. Perhaps this is why people report that it is easier to lose weight when they wear Carnelian. Another reason Carnelian might assist us in weight loss is its detoxifying effect. Toxicity is another big problem in today’s chemically-oriented landscape. Toxins contribute to difficulty in weight loss by lowering the metabolism, inhibiting the signal that you are full, and significantly decreasing a coenzyme needed to burn fat. Our lymphatic system assists us in getting rid of toxins and other harmful waste, which is a big job. Carnelian can increase the productivity of the lymphatic system, and it also permeates deep down to the cellular level to encourage the release of toxicity and disease. When I went through an intensive, week long detoxification program, I brought Carnelian along to support the process. And I was glad that I did! Not only does Carnelian perfectly support the physical body in more effectively detoxing, it also helps in maintaining a positive attitude and the necessary will power. While I was there, I lost over five pounds and saw clear, and sometimes uncomfortable, signs of toxins leaving my body. Not only that, but I did it all with a genuine smile on my face and gratitude in my heart. I felt like I hit a reset button in my body and mind, and it has resulted in a life-style change. That’s the power of Carnelian! You have to be willing to do the work and make some changes, and Carnelian can assist in making it easier. Carnelian is also quite effective in brightening the mental and emotional bodies, and is a good choice if you are facing depression or negative thinking. It can burn away a cloudy mentality and lower emotional states, helping you to focus on the positive in situations. Carnelian is a stone of joy and personal empowerment. It activates the lower chakras, helping us to thrive more in our physical lives and to create blessings through our actions. It has a strong resonance with the sacral chakra, our creativity center. Therefore, it gets us in touch with passion, vitality, sexual expression, and higher creative flow. Since Carnelian is such a dynamic stone that can assist us in many areas, there are several different healing techniques I could share. But let’s focus on detoxification and the lymphatic system, since I believe this is key to boosting general health and well-being on all levels. Please note, to receive the best detox results, I highly recommend consulting your doctor or enrolling in a formal detoxification program led by qualified health practitioners. The technique I will share here will safely and naturally support the process. It will also help you connect with your body elemental for healing any other specific physical issues you might be experiencing. You will need three Carnelian stones; cleanse them before you begin. Lie down, breathe, and come into a relaxed space. Then call upon your higher self and any spirit helpers for support, and hold the intention that the highest possible healing outcome will occur. You will then place a Carnelian on each chakra that connects with the lymphatic system. Place one Carnelian on the throat chakra, at the base of your neck, to connect with the upper lymphatic system. Place one Carnelian on the heart chakra, at the center of the chest, to connect with the middle lymphatic system. Finally, place one Carnelian on the second chakra, a few inches below the belly button, to connect with the lower lymphatic system. Next we will connect with our body elemental and enlist its help in creating perfect healing and the release of toxins and disease. According to Mark L. and Elizabeth Clare Profit, authors of Hilarion, the Healer, your body elemental is like your personal spirit physician who oversees the functioning of your physical body and manifests your divine blueprint of health. It is a three foot replica of you, and it is filled with divine intelligence and the ability to assist your body in creating healing miracles. It creates your state of health based on the messages, thoughts, and feelings you feed it. Therefore, if you are holding limiting ideas about your health, this is what your body elemental will program into your cells. The good news is that, if you directly interface with your body elemental and ask it to begin a healing process in your body, it will do so. Close your eyes, breathe, and call upon your body elemental. See if you can get a mental picture of it, and send it love and gratitude in any way that feels right to you. Open the lines of communication with your body elemental, and send it messages about what you would like to create in your body or about your specific health goals. Then ask it to assist you in your efforts to release or neutralize toxins in your body and to strengthen the functioning of your lymphatic system. Next, place your hands upon the Carnelian at your throat chakra. Feel the warm, life-giving energy permeating into this area, and imagine or intend that it is circulating through the lymph vessels and ducts. Stay here for at least five minutes, or for whatever length of time feels right to you. Then place your hands over the Carnelian at the heart chakra, and feel or sense this energy flowing into the middle lymphatic system for at least five minutes. Finally, place your hands over the Carnelian at the sacral chakra, and send the energy into the lower lymphatic system for at least five minutes. End by visualizing, in any way that feels right to you, Carnelian energy circulating through your entire body and transmuting anything that is not serving your health. When you feel complete, open your eyes and cleanse the Carnelians. Feel free to repeat this process as often as you feel guided to do so, and always know that you can connect with your body elemental at any time to improve your health. I would also suggest wearing Carnelian jewelry on a consistent basis to support your body. In closing, it is no surprise to me that Carnelian is a gemstone that is associated with St. Germaine, the Ascended Master who brings purification through the Violet Flame. May Carnelian bring out your inner radiance, helping to burn away all that would dim your sparkle.